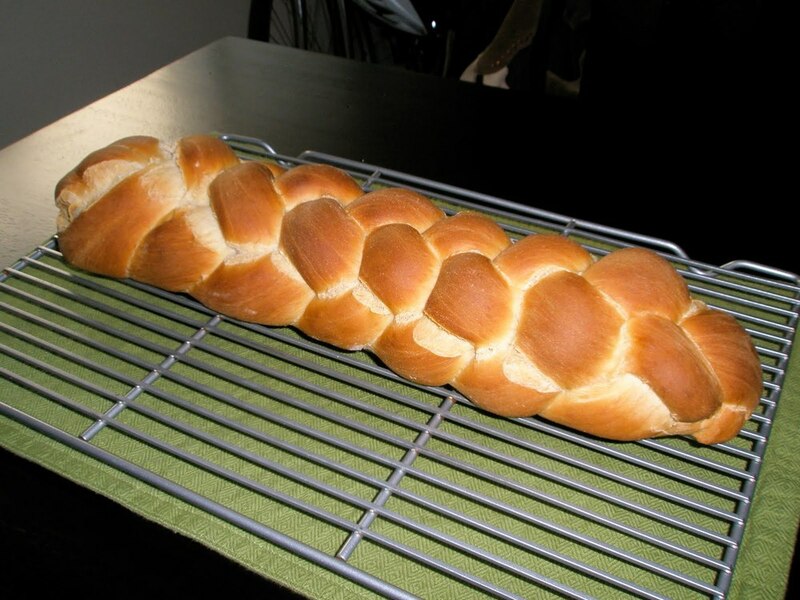 Challah my Gentile and Jewish friends is the best bread on earth, please there’s no need to argue; I’ll win. Challah is wonderful because it can be made sweet or savory with equally exquisite results, and due to the egg yolks and butter is always rich and satisfying. One of my favorite incarnations of this recipe was a jalapeno cheddar loaf; that, due to the moisture of the pickled jalapenos, was extremely messy to make, but which turned out mind bogglingly delicious. More often though I take a simpler route towards altering the flavor of the Challah by coating the loaf in different toppings. For example in the loafs today I made one plain, then brushed the pre-baked loaf with egg white and sprinkled it with sesame seeds. In the other loaf I mixed cinnamon into the batter and then coated the braided loaf in cinnamon sugar. Both were swiftly eaten, and as you can imagine the cinnamon one was great toasted, spread with preserves; while the slightly more savory sesame one was ideal for sandwiches. You can also add in nuts, chocolate, or dried fruit to the batter for other delicious twists. I have had a long standing fantasy about making a big batch of baked french toast with the Challah complete with plump berries and Grand Marnier, but every time that I have tried anyone within grabbing distance of the Challah has managed to eat it before I had the chance. Don’t worry though, one of these days soon I’m going to secretly bake a loaf and turn it into heavenly french toast, and when I do you all will be the first to know. 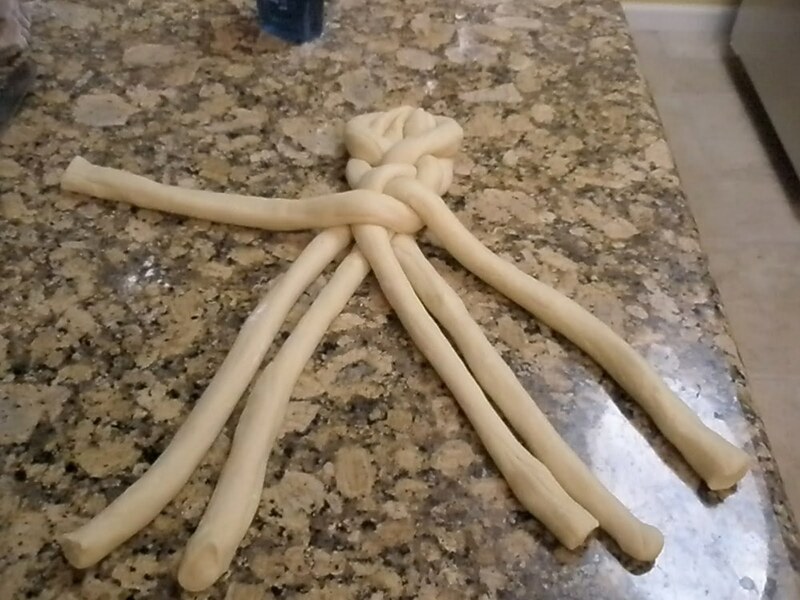 Here is a photo of a six strand braided loaf in progress. It is not as complicated and as it looks and makes for a very impressive presentation. As proof of how manageable this shape is to make the person who taught me how to first do this was my at the time 10 year old sister. So no excuses, go forth and make a scrumptious AND gorgeous loaf. Here is a handy link to see exactly how its done. and not adapted at all because it’s so good! Place water, salt, honey, eggs, melted butter or margarine, flour, and yeast in order given into the bread machine. Set the machine to Dough cycle, and start. Remove dough from the machine after the first rising . 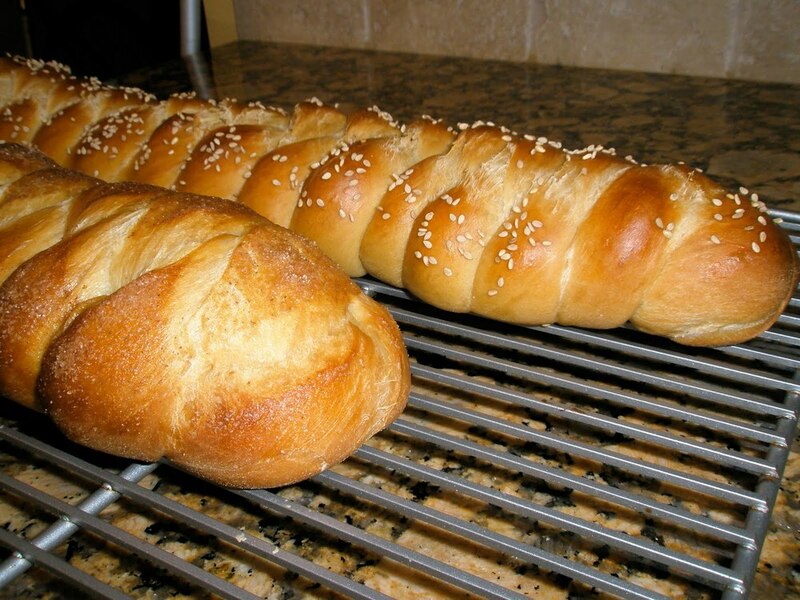 Divide dough into 3 or 6 equal pieces depending upon what type of braid you want to make. Braid the pieces, and tuck the ends under. Place on a greased baking tray. This bread can also be made in a 9 x 5 inch greased loaf pan (but it won’t be as pretty). Allow to rise under a towel in a draft free environment until doubled in size; about an hour. Just before baking brush the loaf with beaten egg white and sprinkle with sesame, poppy seeds, Cinnamon sugar or leave plain. Bake at 350 degrees F (175 degrees C) for 35 to 45 minutes. Bread is done when the crust is golden brown.